In the “battle of un-beatens” at the PPL Center on Saturday night, the SteelHawks once again emerged victorious. It was a convincing win over the rival Philly team which hadn’t lost a regular-season game this season. The team seems to be clicking on all fronts, and should roll into the playoffs. They’ve got two games left with Harrisburg, whom they’ve already beaten and who recently changed coaches. They’ve got an additional game with a Triangle Torch team which they’ve also beaten, and which has to travel to the black turf of Embassy Bank Field in Allentown. The final three games are at home. The SteelHawks now have an effective two-game lead on Philly, but Western Michigan and River City are two other one-loss teams (they’ve beaten each other, both winning at home) also clamoring for the playoffs. Three teams will make it from the Northern Division, with the top team gaining a first-round bye while the other two battle for the right to travel to the top team. If each of the top three teams wins out, then Western Michigan and River City would play a rubber-match game for the right to come to Allentown. Even if the SteelHawks falter–and they’d better not–they still could host a first-round game. I imagine the tiebreaker is point differential, which we would likely own. If so, look for the SteelHawks to not only win these next three home games, but attempt to do so in convincing fashion in order to preserve any tie-breaks. I’m not certain if an overall championship game will be played, but if so, look out for our old friends from Columbus, Ga. They’re also undefeated and appear to be a class above their competition–just like our SteelHawks. If things go as planned–and remember that this is a lot of conjecture on my part here, too–look for a Northern Division Championship game at the PPL Center the weekend of June 3-5, and maybe an overall championship game the weekend of June 10-12. Allentown, PA: Lehigh Valley Steelhawks (5-0) won the Battle of the Unbeatens, taking sole possession of the North Division lead in the American Indoor Football League, taking down the Philadelphia Yellow Jackets (3-1) by a score of 52-33. It was the ’Hawks defense that again kept them in control for most of the game. The first quarter lacked a ton of action with each team only having one possession of the rock, and it was the Yellow Jackets striking first on a 15 yard strike from QB Warren Smith (25 of 38, 258 yds, 4 tds, 1 int) to WR Emery Sammons (15 catches for 172 yds, 3 tds). The Steelhawks would answer with a QB Jake Jablonski (21 of 32, 197 yds, 5 tds, 1 int) to WR Jerrell Young (6 catches for 69 yds, td) touchdown. At the end of the first quarter, the scoreboard difference on the score board was a made PAT in favor of LV. Lehigh Valley controlled the second and third quarters, outscoring Philadelphia 32-6. After a turnover on downs forced by the Steelhawks defense, Jablonski got in on a keeper (20 yds rushing, 2 tds) – followed by a K Spencer Hotaling deuce, then Jablonski would find WR Brandon Renford (7 catches for 52 yds, 2 tds) for another six points. Sammons would record another touchdown for Philadelphia and then Hotaling would add a field goal just before halftime. The score stood 25-12 in favor of the Steelhawks at intermission. The third quarter was all ’Hawks… Jablonski had another keeper, DB Ken Walton (3 tackles, 1 pbu, 1 int) would get the Steelhawks the only interception on the night after a series of so-closes, DL Larry Ford (3 tackles, 2 tfl, sack) would get a Cantelmi Hardware Hard Hit of the Game worthy sack to create another turnover on downs, and then WR Darius Prince (5 catches, 59 yds, 1 td) would get his touchdown grab of the day to end the quarter. The Yellow Jackets would stage a comeback late in the fourth quarter, but it was short-lived. Smith would get six with his legs; OL Jeff Braun would answer for Lehigh Valley with a tight end release for touchdown; and then Philadelphia would score fourteen straight points to start to make things interesting with 3:06 left in the game, having made it a 12 point game. However, a failed onsides kick on the ensuing kickoff would put Lehigh Valley in a prime location to seal the game; which they did with 1:33 left on the clock when Renford snagged a laser in the corner of the endzone. After a successful PAT, the score stood – Lehigh Valley 52, Philadelphia 33. 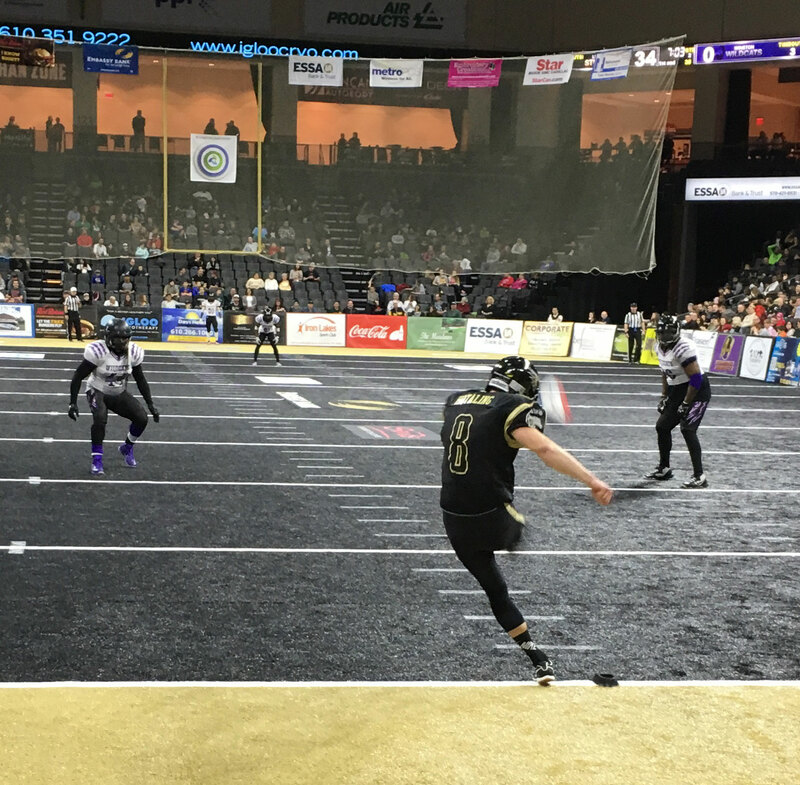 Once again, the Steelhawks defense proved to be the difference after forcing two turnovers on downs, and only allowing three third down conversions on eight attempts. Philadelphia held longer possessions, but were unable to capitalize on many of their long drives. The difference offensively was the arsenal of receivers the ’Hawks had in Renford, Young, Prince, and Edwards compared to the one weapon Smith had in E. Sammons. While controlling their own destiny, Lehigh Valley needs to continue to develop offensively while the defense needs to stay healthy. By scoring 52 points in today’s contest, the Steelhawks have completed the Domino’s 50 Point Challenge. Fans can now get 50% off menu-priced pizzas at all participating Lehigh Valley locations for the next three days, simply use the code SH50 when ordering. The Steelhawks have another home game next weekend before a bye week and then two more home games to finish out the regular season. Next Saturday’s game is at 7:00pm and welcomes the Central Penn Capitals to the PPL Center. Presented by Lehigh Valley Health Network, it’s Health Awareness Night and the first 2,000 fans get a Black Rally Towel to support the ’Hawks. It’s not too late to get 2016 flex packs either. Both they and individual game packages to watch the Steelhawks play inside the PPL Center are on sale now. Keep checking for the latest news and events from the Steelhawks. ‹ Winning! Can We Handle It?